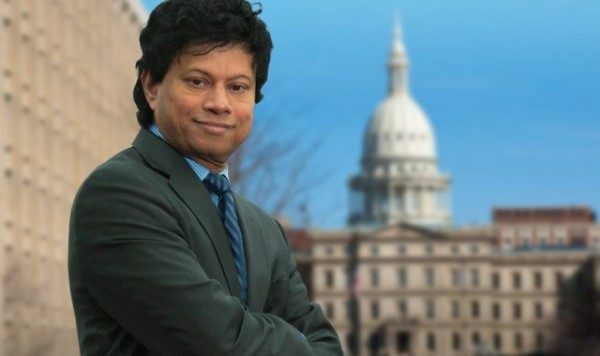 Entrepreneur Shri Thanedar, originally from Belagavi, who has experienced a rollercoaster of business successes and failures, is running for Michigan Democratic governor in 2018, saying he is best-suited to help the state in part because of his own comeback story. Dr. Shri Thanedar immigrated to the United States in 1979 from Belagavi, India to obtain his PhD in polymer chemistry from the University of Akron (1982) after receiving a Masters Degree at the University of Bombay (1977). He then worked as a post-doctoral scholar at the University of Michigan (1982-1984). Shri worked as a Polymer Synthesis Chemist and Project Leader at the Petrolite Corporation in St. Louis, MO (1984-1990). In 1990, Shri worked at and then purchased a three-employee service company called Chemir. Under Shri’s ownership, the company went from $150,000 in annual sales and three employees to $63 million in annual sales and over 400 employees, a trend that has followed him throughout his successful career. During his professional career, Shri purchased or sold eight different businesses. He is skilled in turning around troubled companies. Shri’s story began half way around the world in Mirapur Galli, Shahpur in Belagavi. Growing up as one of six children in a low income family, he was taught about the importance of education and need for financial independence. He was enrolled in the local public school system and excelled due in large part to the wisdom installed in me by my mother Sulochana. He used to stay with his family in Mirapur Galli, Shahpur. He had scored a meager 55% marks in his SSLC and had got a job at the age of 18 itslef in the State bank of India in Bijapur. But he wanted to do his MSc. But the principal of the Dharwad did not allow him to do so. He had to go upto the Vice Chancellor for the same and atlast he got the permission. But the bank denied him leave for his exams for 15 days and he decided to leave from Bijapur and came to Dharwad for his exams. He slept for only one hour for 8 days and finished his studies. Even before his exams got over he got to know that he had been fired out of his job from the bank. His book ही श्रीची इच्छा (English: This Is Shri’s Wish) was a bestseller which is a memoir by Dr. Shrinivas Thanedar. The 62-year-old Democrat announced his candidacy at a Detroit business incubator Thursday. Last year, he sold a majority stake in Avomeen Analytical Services, a chemical-testing company he founded, and made news by giving $1.5 million in bonuses to roughly 50 employees. “America gave me a chance to succeed, and Michigan nurtured my American dream. My success has given me the freedom and the obligation to give back to those around me, from my employees to my community to my state,” Thanedar said.